Welcome! The Central Illinois Chapter of the 100 Black Men of America, Inc. (100BMCI) has grown over the years and continues to be committed to making a difference in the lives of young people, especially young African Americans. One of our programs, the “Mentoring for Life” program, is the very corner stone of the good work we do in our community. We are involved with local scholarship programs that award money to the brightest students for continuing education. We also hold an annual health & wellness breakfast and are involved in many community partnerships that support financial literacy as well as education. The 2017 Mentoring for Life application is available for download. Please click here: M4L_Application2017 Mentoring the 100 Way is a holistic approach that addresses the social, emotional and cultural needs of children ages 8-18. It’s really what we’re all about. Members become mentors, advocates, and role models for the youth within our community. Through chapter operated one-on-one and group mentoring efforts, our members forge relationships that positively impact our greatest resource, our youth. Our efforts focus on building essential skills needed to become productive, contributing citizens in Bloomington/Normal (Central Illinois). Mentoring the 100 Way is a holistic approach that addresses the social, emotional and cultural needs of children ages 8-18. It’s really what we’re all about. Members become mentors, advocates, and role models for the youth within our community. Through chapter operated one-on-one and group mentoring efforts, our members forge relationships that positively impact our greatest resource, our youth. The “Excellence in Mentoring Gala” is an event focused on highlighting one of the core objectives of The 100 Black Men of Central Illinois, mentoring, and all the values and benefits that it offers to the community. Attendees will be able to see how The 100 Black Men of Central Illinois partners with local business and organizations to reach our shared goals of building a better community. Proceeds from this event will support our mentoring, scholarship and community service programs. Get tickets to the 2016 Excellence in Mentoring Gala. Keynote speaker: Dr Harold Davis, founder of the TALKS mentoring program. The African-American Hall of Fame Museum inducted six new members during the 28th annual Red, Black and Green Ball on Saturday evening. Get the full story here. Read about the recent scholarships awarded by the 100 Black Men of Central Illinois. 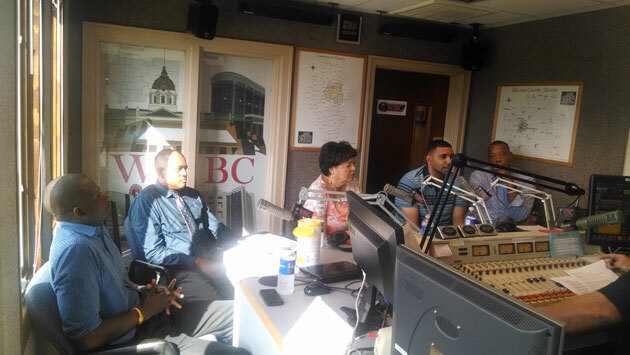 100 Black Men of Central Illinois chapter president Dale Avery participated in WJBC’s roundtable on race relations. Listen to the Race Relations Roundtable here.